Spraying Systems Co. has expanded its line of CU150A GunJet® low pressure spray guns. Now available in stainless steel in addition to brass and aluminum, the CU150A GunJet spray gun features an adjustable spray pattern making it suitable for use in many applications and industries including food processing. Users can easily adjust the spray pattern from a solid stream to a 50° hollow cone spray pattern by varying the trigger pull. This flexibility enables operators to easily move between areas that require different levels of cleaning without interruption. The CU150A GunJet spray gun also features an ergonomic design to reduce user fatigue and maximize cleaning time. 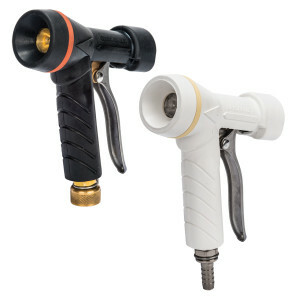 The spray gun is available in three capacities ranging from 10 to 22 gpm (38 to 83 lpm). Spray capacity is clearly designated by color bands on the protective rubber cover to ensure operators can quickly select the proper spray gun for the cleaning operation. The choice of materials enables users to match the gun durability to the cleaning requirements. The 316 stainless steel version with a white cover is designed for use in food processing plants. The brass and lightweight aluminum versions are traditionally used for general plant and equipment clean-up. All CU150A GunJet spray guns include a corrosion-resistant outer cover to extend wear life.